Prentiss Nixon. Credit: Stephen R. Sylvanie, USA TODAY Sports. 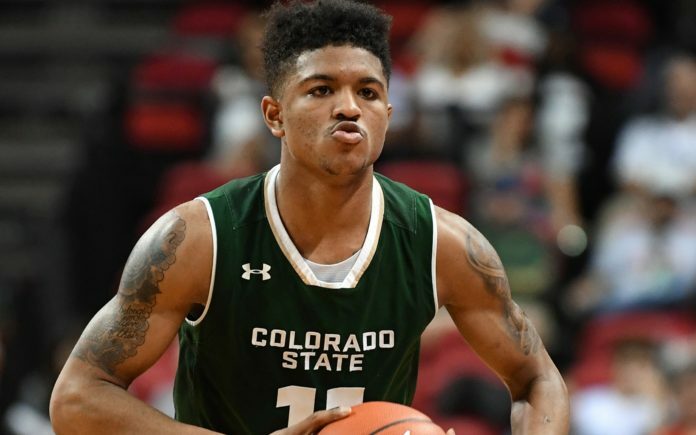 The Colorado State men’s basketball team picked up their second road win of Mountain West action and ended Utah State’s five-game home winning streak with an 84-75 victory in Logan, Jan. 10. With the victory, the Rams are now 9-9 on the season and 2-3 in Mountain West action while the Aggies fell to 10-8 and 3-2 in the league. The two teams went at it in the early going with both teams taking small leads, with the tie at 18 apiece with 8:59 to play in the game. Utah State took a 22-20 lead on a pair of Dwayne Brown free throws, but a three by senior forward Che Bob put CSU up 23-22, an advantage that the Rams wouldn’t give up the rest of the half as the visitors eventually led 41-31 at the halftime break. Rams built the lead on 50.0 percent (15-of-30) shooting in the opening half, including 4-of-8 from the three-point arc. CSU also was solid defensively, limiting Utah State to just 37.0 percent (10-of-27) from the floor and 23.5 percent (4-of-17) behind the line. CSU came out strong to start the final 20 minutes, scoring the first seven points of the period to push the margin to 17. The Rams used strong defense and solid offense to get the lead to as many as 22 at 60-38 with 14:31 remaining. Known for second-half comebacks this year, Utah State battled and chipped it down to 10 at 66-56 with 6:01 to play. However, junior guard Prentiss Nixon took over with back-to-back three-pointers, a steal and a pair of free throws to push it back to a 15-point advantage just after the final media timeout. The Aggies kept coming but CSU had the answers down the stretch before settling for the nine-point win. For the game, Colorado State shot 46.3 percent (25-of-54), including 44.4 percent (8-of-18) from the three-point arc. Utah State finished at 42.1 percent (24-of-57) from the floor and 34.4 percent (11-of-32) from outside the line. The Rams were stellar at the free throw line, hitting 26-of-33 attempts (78.8 percent) while the Aggies were just 61.5 percent (16-of-26). The teams tied at 35 in the battle of the boards. Nixon finished with 26 points, 22 coming in the second half, on 8-of-14 field goals, 4-of-6 three-pointers and six free throw attempts. Bob finished with 19 points, his second highest of the year, while redshirt-sophomore Nico Carvacho had his second straight double-double with 10 points and 15 rebounds along with four assists. Sam Merrill led Utah State with 18, with Daron Henson and Koby McEwen adding 12 and 11, respectively. Colorado State finishes up the current road trip with the first installment of this year’s Border War, traveling to Laramie to take on Wyoming, Sat., Jan. 13 at 2 p.m. The contest between the Rams and Cowboys will be televised on CBS Sports Network with Rich Waltz on the play-by-play and Pete Gillen on the analysis. The game will air across the Colorado State Sports Network (along with online at CSURams.com), with Brian Roth and Adam Nigon on the call.